Kareem comes from the three-letter root ka-ra-ma. According to Lisan Al-Arab, it encompasses all kinds of good, honor and virtues. As we will see, the concept of karam is more expansive than a superficial understanding of generosity. Another meaning is also alluded to in Maqayees Al-lugha, that karam can refer to something that intrinsically has honor in and of and itself. God Almighty always goes over and beyond what is needed, when He does not have to. He forgives, He follows through and He gives. Why? Because He is ultimately Al-Kareem. Paradise is the ultimate manifestation of God's generosity. Fairness may be in giving us a good life for whatever good we did (which is ultimately from His bounty!). But Paradise removes even the memory of whatever we were afflicted with. Paradise is a place that we cannot even imagine—where everyone will have what he wishes, and everyday is more fascinating than the previous. 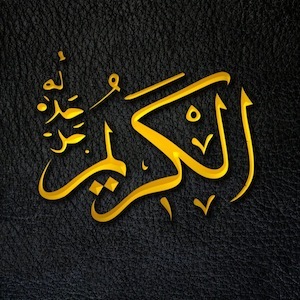 God Almighty (exalted is He) also says: “And We have certainly honored the children of Adam and carried them on the land and sea and provided for them of the good things and preferred them over much of what We have created, with [definite] preference.” (Qur’an 17:70) The word used for honored is karram-na, from the same root karam. God Almighty has given the human being a sense of honor and dignity in being human. Thus, recognize the worth that God Almighty has given you in being a human being, with intellect and a capacity to choose. This dignity was given by God; and as people, we must act in ways that are dignified. We dishonor ourselves by lying, cheating, being rude, and ignoring injustice.